While the entire town is off bouncing around enjoying the amazing art events that descend upon Miami during the week of Art Basel, we moms are home helping with homework, tucking kids into bed and catching up on work that has fallen behind because we went to watch our kids’ extracurricular activities. Lucky for us, Ford was kind enough to invite us to lunch at the newly opened Toro Toro at the InterContinental Hotel to share what they’ve been up to during Art Basel. 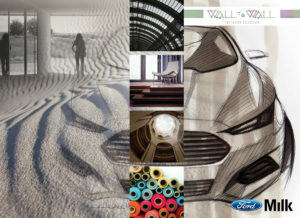 We were able to live vicariously through their amazing team and learn about the amazing exhibits we’ve been missing especially Ford and MILK Studios’ ‘Wall to Wall: The Fusion Collective’. The collective combines digital and physical experiences to celebrate renowned and emerging artists across multiple disciplines. The collaboration between Ford and MILK Studios first debuted in New York, traveled to Los Angeles and now made its way to Miami. All of the works featuring in the installation are inspired by the Ford Fusion. 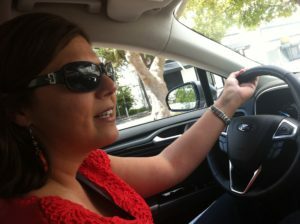 We had the opportunity to test drive the new Ford Fusion in September and it definitely inspired Cristy! Her first time driving stick shift since the birth of the twin tweens was pretty exciting and I really enjoyed the sleek design and attention to details. 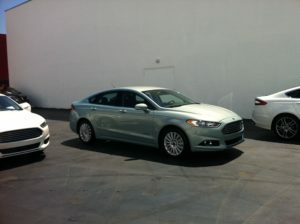 During lunch, we had the opportunity to speak to the women responsible for the design and details of the Ford Fusion. Francesca Montini, Ford’s Global Quality and Design Communications Manager, and Jennifer Hewlett, their Versatile Designer , two powerful and travelled career women – yay! I asked them all kinds of questions about global trends in color and changes in design. Did you know that women prefer the wood grain interior over the colder aluminum look? Did you know that Europeans prefer brighter more fun colors? It was inspiring to learn how the Ford Fusion is a functioning piece of art created by Jennifer and the design team at Ford which is now inspiring other artists to create amazing pieces featured in the ‘Wall to Wall: The Fusion Collective’. 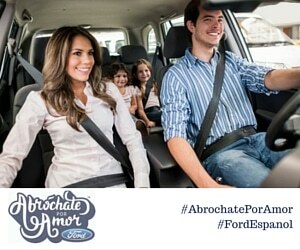 So until the tweens head off to college and we can actually visit Art Basel we are extremely thankful to the Ford team for sharing just a little bit of the fun with us!